Suicide prevention is a shared focus of the Victorian Government Department of Health and Human Services and the Primary Health Networks, an Australian Government initiative. Key polices include the National Suicide Prevention Strategy 2015 and the Victorian suicide prevention framework 2016-25. 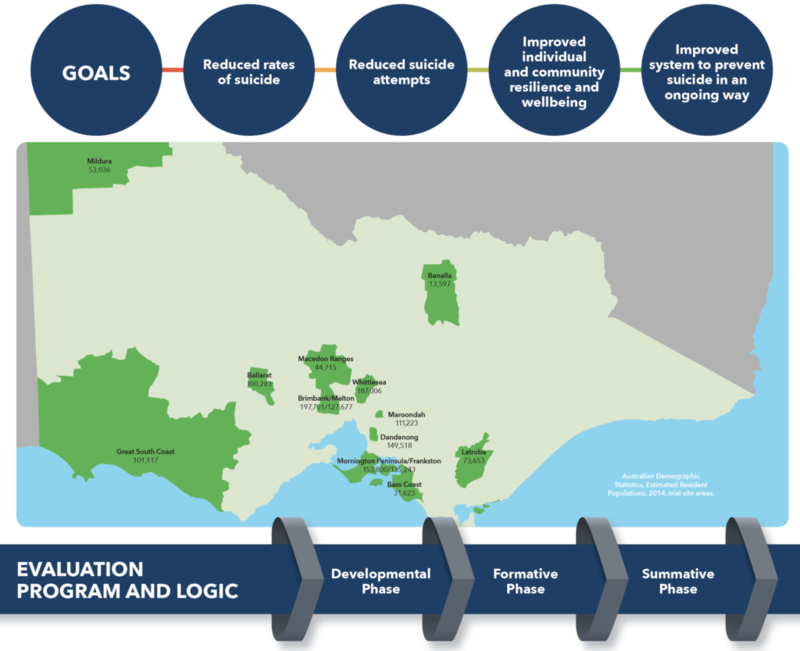 In line with these, the Victorian Government Department of Health and Human Services and the six Victorian Primary Health Networks are implementing a collaborative response which will see place-based approaches to suicide prevention being implemented across twelve metropolitan, regional, and rural locations of need over a four year period. A place-based approach recognises that people and places are inter-related, and that the places where people live and spend their time affects their health and wellbeing. A place-based approach focuses on local needs and local priorities, engages the community as an active partner in developing solutions, and maximises value by leveraging multiple networks, investments and activities to deliver the best outcomes for communities. Each community will establish their own suite of responses based on their local need and local capacity. These collective efforts are guided by a robust statewide operating model, evaluation approach and other relevant frameworks. The place-based trials seek to have a positive impact on rates of suicide and attempts, individual resilience and well-being, and broader system improvements. This innovative approach has provided a means to pool local understanding and latest evidence, align funding streams and collective health investment, and provide a basis for shared outcomes in this important area. The initiative involves joint commissioning of evidence-based suicide prevention approaches which integrate collective impact insights, build workforce capacity, and enhance effectiveness of the existing service system. The delivery of place based suicide prevention interventions is supported by the Eastern Melbourne PHN, Gippsland PHN, Murray PHN, North Western Melbourne PHN, South Eastern Melbourne PHN, Western Victoria PHN and the Victorian Government. PHNs are an Australian Government Initiative. An overview of place-based suicide prevention trials in progress across the state. Take a look inside Murray Primary Health Network’s place-based suicide prevention trial in Mildura. Eastern Melbourne Primary Health Network’s place-based suicide prevention trials are also underway. A look at the Bass Coast and Latrobe place-based suicide prevention trials coordinated by Gippsland Primary Health Network.